The great futuristic society of I-Star has long foretold the coming of a female with a gem embedded in her forehead. Known as the Dark Messiah, this woman possesses magical powers that will bring about the destruction of life as they know it. When a young Cassidy awakens inside an enchanted cave, she has no memory of how she came to be in this strange place. She starts to build a life for herself in the modern, utopian world of I-Star. The odd red crystal in the middle of her forehead disturbs her, as no one else in the community of Jennison has such a marking. Cassidy soon catches the attention of a mysterious sorcerer, Dmitri von Calvin, who recognizes her as the Dark Messiah and wishes to harness her power for destructive ends. 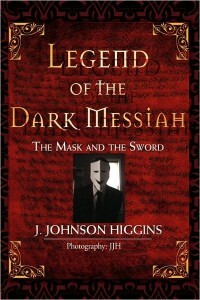 Cassidy learns of the sorcerer’s evil agenda and the prophecy of the Dark Messiah. Rather than fulfill her role as a life destroyer, Cassidy makes a decision to stand and fight against the destruction of her beloved world. Legend of the Dark Messiah: The Mask and the Sword is available in paperback, hardcover, Kindle and NOOK at Amazon.com, Amazon UK and Barnes & Noble. The world of mortals is said to be but a reflection of the world of deities; their feuds become our feuds, and their grievances become our grievances. The nobler gods are the ones that humankind trusts for order. They are rulers like Life, Love, and even Death. Some like to compound them into one great god, while others break them into atoms and energy, but in the end, it does not matter. They are the nobler Powers That Be, and they have ruled the human world for centuries. But humankind does not trust the lesser gods without entitlement: Vengeance, Greed, Deception, Chance, and Fear. Some combine them into one evil lord, while others call them anomalies, imbalances, and mistakes. Will the lesser powers have their day? Not so, say the noble ones: Birth, Honesty, and the playful sister Change. There was one lesser god, however, that did not agree. One that had grown so powerful that he was given a human name: Darrot, the masked god of vengeance. It began thousands of years ago, when Darrot attempted to slay the noble gods. When he failed, he was banished from the land of the gods and sent to live among the mortals, forced never to show his face again. He remained hidden behind a mask and spent his immortal years in solitude atop the tallest mountain, where he built a great palace. He was soon forgotten, and his palace faded into an indistinguishable part of the conical landmass. There was relative peace in the lands of both gods and mortals. All wars ended. But a dormant threat remained. A black cloud circled the mountain. What if Darrot sought to slay the worshippers of the noble gods, the ones who gave them power to rule? Unlikely, the noble gods naively assumed. He cannot harm mortals with his own hands while he lives between worlds. Who would have thought that the masked god would rise again and seek revenge? Other forces betrayed by the noble gods would later befriend him, and mortals would willingly slay the children of the noble gods in the name of revenge.